DNF 289/708This just isn't for me. I figured it wouldn't be for me going in, since I wasn't a big fan of the original anime series and never saw the movies either. I only took a stab at reading it so I could continue to crack my jokes about another hugely-popular anime series that also has a million and two spin offs, since it was picking on both at the same time. I wanted to be sure that my joke was accurate, since the library just happened to have this, I figured I'd give a shot.I flipped through the rest of the book, and it turns out that it doesn't really devolve into Pokemon-style battles with angels and Eva. It's more of a self-important Magical-Boy-Chosen-One with magical weapons and stuff. Now, I'm not against Magical-Boy-Chosen-One narratives. The problem I have with this one is the fact that it starts coming across as... pompous after a while. It's dense, text-heavy, and vague for the sake of being vague.It's like one person said, "Hey guys! Let's make a high school drama!" and someone else said, "But this is my magnum opus!" and the two decided to just smoosh the two together. The typical high school scenes are good, with mysterious transfer students and school plays that self-destruct. But then it gets dense and heavy and seems to forget entirely about its overdone premise of high schoolers with super powers and jumps instead into the overwrought battles for humanity.And you know the worst part? 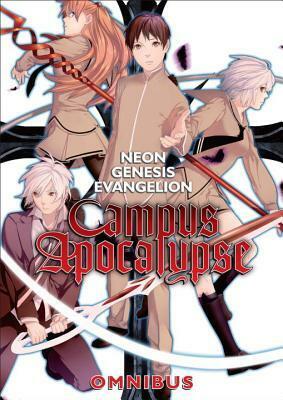 Campus Apocalypse dropped the one thing that I really liked about the original anime series: True-To-Revelations Angels. These angels are just the ones you find in any urban fantasy: people with wings.Ultimately, Campus Apocalypse feels like it didn't know what it wanted to be. It couldn't figure out if it wanted to be an urban fantasy high school manga or, well, Evangelion. I can't speak for a proper Eva fan's reaction to this one, but as someone who knows just enough to be dangerous, this doesn't work as an adaptation for a non-fan. Heaven help someone who goes in knowing nothing about Eva.All-in-all, this was not meant for me, and it doesn't work for me. I got through maybe a volume and a half contained in this omnibus, so I'm not going to rate it. If asked, it'd probably be a 1.5/5, but I'm not going to officially rate this one. It's okay if you need an Eva fix, which I was in dire need of after scarfing down the original's 5th and long awaited omnibus. I was told if you are to explore the alternate realities of the NGE world, this was the most acclaimed of them all. This sets an unfortunate precedent to not investigate the other titles. I wasn't particularly gripped by the plot until the last couple of chapters - not exactly a good thing; I was force feeding my eyes to finish. Some returning characters of the NGE universe are diluted into overly used anime character designs. Not sure who oversaw the translation at Dark Horse, but it is jarringly awkward at times and makes some scenes difficult to follow. This is odd, considering they can master a character like Toji's dialect, translating Osakan-to-Brooklyn speech patterns with believability. Mingming's art is clean to the point of being sterile. The anatomy is a bit off at times too.Overall, just not great. Though, in its defense, it's hard to stack up to the original source material. Enjoy at your own risk. This isn't the first manga I've read, but so far it's the worst. I had no idea what the heck was going on, the odd vernacular of one character sounded like he was giving a Cajun accent a whirl, and the characters looked so much alike I was constantly flipping pages back and forth. "Full Metal Alchemist", my favorite manga so far, didn't give me this many headaches. I'll try "The Death Note" later, and hope I have better luck. Collects all 4 volumes of this mini-series spin-off. A nice omnibus edition with colour pages at the beginning of each volume and paper a bit nicer than what you find in viz's omnibus editions. I've read the original Evangelion series, but am not a super fan or anything like that so can't really go in-depth about characters, etc. However, this is a very different take on the series and is set prior to the original series and basically takes a completely different spin on the story It's still science fiction but no giant mecha fighting machines. Shinji and Kaworu are the main character emphasis and the story is based on "angels" (the enemy) inhabiting human bodies. I really enjoyed the story though I found at points it seemed to have continuity problems. It was fun to revisit all the characters even if they were presented differently, they still had the same basic personalities. While this is still a serious story, it is certainly much lighter than the immensely heavy original series. I don't watch anime so am only speaking from a reader's pov, but I found this a worthwhile read and entertaining reimagining of the series. It was fun! Most of the characters stuck with the personalities of the original NGE characters, but it didn't tear my heart out like watching the anime did. The new storyline is a fun read, too.